Futuremark is readying a follow-up to Fire Strike Ultra, the world's first 4K gaming benchmark, released three years ago. 3DMark Time Spy Extreme with support for both 4K visuals and Microsoft DirectX 12 has been released to the press and will be subsequently released to the public (from 11th October). The new 3DMark Time Spy Extreme benchmark has been developed with input from AMD, Intel, Nvidia, and the other members of the Futuremark Benchmark Development Program. This application is intended to test gaming systems featuring the latest high-end graphics cards and new processors with eight or more cores. As Futuremark points out, a decade ago many gamers were asking about the benefits of equipping a dual-core processor. Now we are looking at AMD and Intel introducing processors for enthusiasts that boast as many as 18 cores and 36 threads. 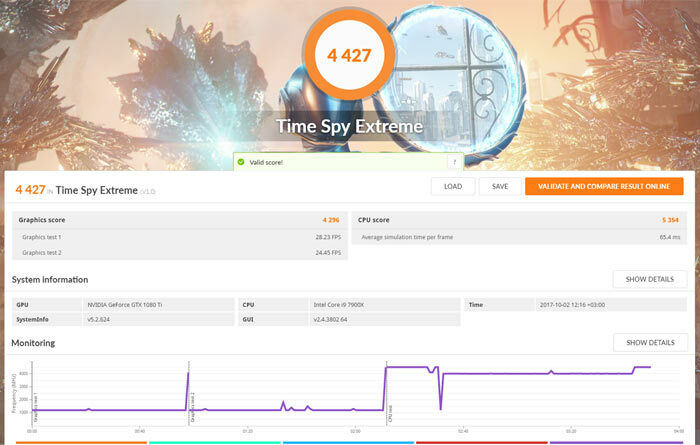 3DMark Time Spy Extreme has been developed to use the full potential of eight or more CPU cores as well as modern graphics accelerators. It also supports extensions such as AVX2, when available. When compared to Time Spy, the Extreme CPU test is said to be three times more demanding. However, thanks to DirectX 12 with its reduced overhead and better utilization of modern processing hardware, your many multi-core system could respond favourably in this test. The public release of 3DMark Time Spy Extreme will become available, as mentioned in the intro, from 11th October. It will be provided as a free update for 3DMark Advanced Edition and 3DMark Professional Edition licenses purchased after July 14, 2016. If you bought your copy before that cut-off date then the new 4K DX12 benchmark can be added by purchasing the Time Spy upgrade.